The purpose of this section is to help Engineers/Architects better understand why we request CAD drawings, what we do with them and how sending the CAD drawings to Los Angeles Air Balance is a benefit to the project. It is our goal to provide a report that is easy to read, easy to understand and easy to refer to at a later date. 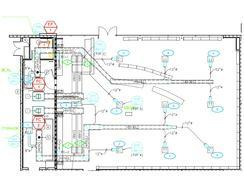 One piece of this goal is the schematic layout of the project. By incorporating the Engineer's drawing into our report, we are able to utilize drawings that everyone is already familiar with and provide a way to leverage that familiarity when reviewing or refering to our Test and Balance report. Coding up drawings that are sent to us is also significantly faster and can reduce the time between the hand written report getting into our office and the finalized report leaving our office. 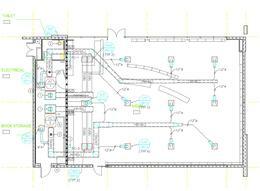 To the left, you can see an example of a CAD drawing sent to us. Please note that this is only a section of the drawing and is being used to show the additions we make to the drawing. Once we receive the CAD drawing, our CAD department adds a few layers to the drawing and inserts symbols onto the layers that match up with our air balance report. This is done so that whoever is reviewing the report can easily identify what piece of equipment we are reporting on. Please send CAD drawings in a format compatible with Autocad 2006 LTE and with all related externally referenced files. If your company policy requires a release waiver, we are more than willing to comply in order to protect your intellectual property rights. Thank you in advance for your assistance and cooperation completing whatever projects we are working on together.